Yesterday (Thursday), the Volatility Index (VIX), which is often referred to as the "investor fear gauge," jumped 32.2%, its highest advance on the year and the index's biggest surge since April 2013. The VIX spike was triggered by the downing of a Malaysian passenger plane on the Ukrainian-Russian border that killed 298 people, and an Israeli invasion of the Gaza Strip after ceasefire talks broke down. The global factors weighed heavily on investor sentiment and the VIX skyrocketed as a result. There's a common misconception that the VIX measures stock market volatility. The VIX is really used to identify short-term market expectations through a complex formula that uses near- and next-term put and call options as its components, as opposed to an index like the S&P 500 that uses individual companies to derive its valuation. When the markets grow, the VIX will generally shrink alongside positive investor sentiment and a growth in the major stock indexes. But in times of uncertainty, such as during a financial collapse or geopolitical turmoil, investors load up on option trading to bet on the market's downside. The VIX will then spike. "As a contrarian indicator, the VIX usually has an inverse relationship with the markets," said Money Morning's Capital Wave Strategist Shah Gilani. "When the market is rallying the VIX tends to drop; when the market is tanking the VIX tends to rise. The scarier the broad market decline the higher the VIX tends to go – hence its reputation as the fear gauge." Though there is no true statistical inverse correlation between the VIX and the S&P 500, in general the VIX will jump when the S&P 500 dives. The biggest VIX spikes, such as the 50% jump on August 8, 2011, are often accompanied with significant drops in the S&P, which dropped 6.7% on that same day. And this is what happened yesterday. The S&P was down 1.2%, its biggest drop in three months and its sixth-biggest drop on the year, and the VIX had its biggest advance in 15 months. The VIX stood at 14.54 when markets closed yesterday, which is still very low and is significantly lower than its highest close this year of 21.44 on February 3. Gilani said a reading greater than 30 is generally associated with elevated volatility and uncertainty, and a value below 20 signifies more confidence in the market. When it's broken down, the 14.54 figure is a rough estimation of the annualized movement in the S&P 500. This current figure would thus estimate a market movement of 14.54% over the next year. 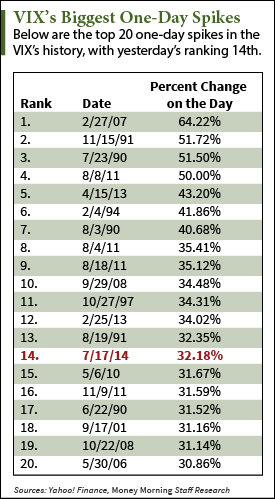 One important thing to understand about the VIX is that a big spike in this index is not a sign to flee the market.